Goozell Dollar Days 2012. Items for a buck and Items a buck OFF! Goozell Items for a DOLLAR! & Goozell Items a Dollar OFF! 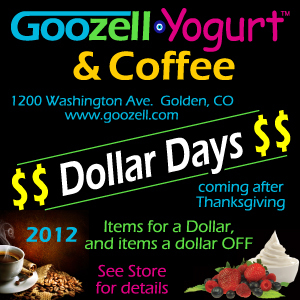 Starting November 23rd, 2012 and running through December 23rd, Goozell Yogurt and Coffee is having their “Dollar Days” promotion in honor of the holidays when you mention this Ad. $1.00 for 2 chocolate chunk cookies. From Goozell Yogurt, to bakery items, or espresso drinks and Goozell’s Turkish blend coffee; come enjoy a treat during the Holiday Season to warm you up or make you smile. Goozell Yogurt is a family owned and operated business located in the heart of historic downtown Golden, CO at 1200 Washington Avenue. Goozell offers gourmet self-service frozen yogurt, a full espresso bar and their own custom blend of premium Turkish Coffee. Inquires can be sent to info@goozell.com or for additional information please go to www.goozell.com. This entry was posted in Coffee House, Deals, Espresso Bar, Frozen Yogurt, Goozell, Goozell Dollar Days, Goozell Gourmet Soups, Turkish Coffee and tagged Coffee, Deals, Frozen Yogurt, Goozell, Stocking Stuffer. Bookmark the permalink.